Music while studying, is it detrimental? Many things I do throughout my day, I do with music. I listen to music when I’m just laying around my room, walking to class, or working out at the gym. One thing I sometimes do without music however is school work. I find it hard for me to concentrate on my school work with loud music on in the background. I will sometimes however listen to softer music, or sometimes even sports talk radio while I work. Conversely, my roommate can do homework while listening to louder music, even rap and faster music. Because of this contrast in styles I wanted to look into listening to music while studying, and if it is detrimental, or beneficial, or if it just depends on the person. There are many conflicting reports out there in many articles that I browsed through. 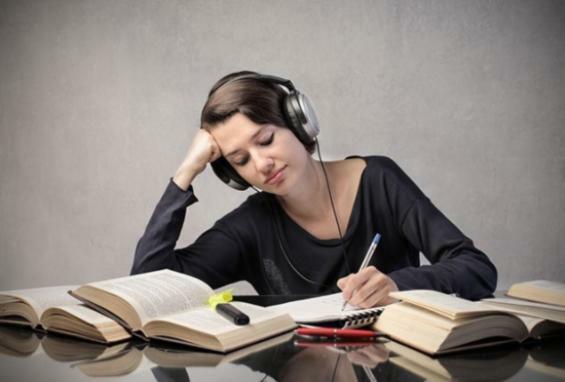 Many articles state how listening to music while studying or learning can be beneficial to the student. One article that I found described the benefits of classical music on students test scores. The University of research in France found that students who took a math quiz after sitting in a lecture with classical music in the background scored higher than those who sat in the lecture without music. Their hypothesis behind their findings is that the classical music causes the students to be at a more emotional state where they retain information at a better rate (USC). On the other hand there are articles and studies that claim that listening to music decreases your performance in school. A 1977 study conducted by Smith and Morris compared the cognitive skills of students while either listening to their favorite genre of music, or not listening to music at all. The individuals were asked to repeat a set of numbers backwards. The results showed that those who were not listening to music at all performed far better than those who were listening to their favorite genre of music (Inquires). Another study I found was conducted by the University of Wales. In the study there were five different test groups that ranged from complete silence while completing a test to heavy metal music to completing a test with no music at all. Total there were four groups that had music or some sound during the test, and one with complete silence. “Steady state speech” in which a single number was repeated for the entirety of the test. “Changing state speech” in which different numbers were played throughout the test. “Liked music” in which a song of the subjects favorite genre choice was played throughout the test. And “Disliked music” in which a song of the students distaste ex. heavy metal was played throughout the test. The test was a series recall test in which the students were asked to repeat a series of number in the same sequence that they were first introduced to them. The study concluded that there was no difference in performance between the two music and changing state groups, however the group that completed the test in complete silence, and steady state groups performed better (Mind). These two test results show that there could possibly be a link to decreased test performance due to music. Overall the conflicting test results, and articles lead to the conclusion that it just depends. It depends on the situation, what you are completing, and the mental make up of the person doing the work. This is very interesting thing to talk about. I have never been abele to effectively study while listening to music, but I always do it anyway. I find that when I listen to music when I study, I will stat to only hear the song and start to sing, and when I start to sing, I lose focus on what I am studying. MY roommate however cannot study at all unless she is listening to music. I Learned before like you mentioned in this post that its good to listen to musics while studying, as long as the songs don’t have words, i.e. classical music, as you mentioned. I found this article which talks a little bit about how music helps with anxiety, specifically surgeons that listen to music before surgery. In the same article, it is mentioned that people will argue for the “Mozart Effect” which is the belief that listening to classical music is beneficial, which is exactly what you have discussed and that is a very interesting thing to think about. You say that the results depend, is is possible that the depending factor may be the type of music that one listens to when doing work or studying? This is very interesting. I used to not be able to listen to music at all when studying. It was always a huge distraction. I would find myself singing the song instead of actually focusing on my work. This has changed for me, though. Not only am I now able to listen to music while studying, but I actually prefer it. I don’t know what has changed, but listening to music while studying seems to help me retain the knowledge more. In the article posted below, a Stanford professor says that listening to music negatively impacts one’s ability to read and write. The article, for the most part, talks about why you should not study and listen to music at the same. Personally, I have never been able to study with music. It is just another distraction that helps aid me to procrastinate. I understand that for some people it helps them study, but that concept is so foreign to me. Here is another article that looked at this topic. Interestingly enough, it found that those who listen to music tend to not do as well on exams as those who do not listen while studying. But it does indicate that the genre of music and how loud the studier is listening to it, does play a factor in how well someone does on the exam. I have thought about this so many times as I am one of those people that does homework with music on, especially my favorite music. Honestly, I think it mainly depends on what work you’re doing and the volume of the music. I find that if i have the volume a little too high I get distracted a lot easier. If I keep the music at a decent volume and I am doing homework that isn’t the most challenging I usually am fine. Let’s say it’s Calc… yeah I don’t know that would work out for me. I think that the main factor in this is who the person is. I personally can’t focus when I am listening to music but almost all of my friends say that it helps them a lot. I think that for most people music does help them because it helps to stimulate the brain, however it definitely matters what type o music the person is listening too. If they are listening to very loud heavy metal music then it will be harder for them to concentrate. Seeing as we are in college and so into our phones and music i find this article very interesting. I also find it interesting how researchers try to find correlating factors between studying and how well you preform in your work. There is also another study that says we are not as good at multitasking as we thought we were which is a bit disheartening but eye opening to see. This is a video explaining why we cannot multitask https://www.youtube.com/watch?v=BpD3PxrgICU and it makes sense seeing as our attention is split between music and working.